Imagine rolling views of mountains, high meadows dotted with Elk, and a crackling fire in the hearth to warm your feet by. 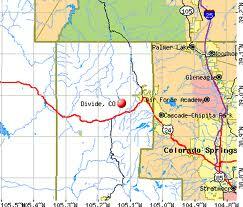 This is what you will find in the secret hideaway of Divide, Colorado. The median price of homes here is only $172,500 and with a population of only 4,226 there is room to breath the refreshing mountain air. While Woodland Park and Colorado Springs are just a short drive down Hwy 24, Divide is still far enough off the beaten path to provide plenty of peace and quiet. The recreational opportunities here are endless as well. Hiking trails abound here, some of the most popular are the Crags trail which goes to the summit of Pikes Peak, Mueller State Park, and Horsethief Park is a great place for a picnic. There is fishing at Crystal reservoir and on the South Platte River; and when the sun goes down there are the casinos at Cripple Creek, just down the road. There is also the Dinosaur Resource Center and the Florissant Fossil beds nearby which give insight into the unique history of the area; as well as shopping in the quaint town center. High school students here go to Woodland Park High in the Woodland Park Re-2 school district, while Summit Elementary school is located right in town. With it's quiet, peaceful setting, incredible views and recreational opportunities, Divide Colorado is a great place to consider buying a home. Search the #1 site for Divide Real Estate listings.